"Great quality. Fit isn't quite true to the size indicated (fit younger daughter better than older daughter) on the website but nice glasses nonetheless." "Best sunglasses I have owned. Amazingly light weight." "Very comfortable lenses and frame, good in very high light, but not quite as good as my Cebe’s in that situation." "Amazing pair of sunglasses, perfect for climbing"
"Ordered as a gift for my boyfriend who really loves it!!" "Love these. Fast delivery. Fit my son well." "Great classes, good price and service. 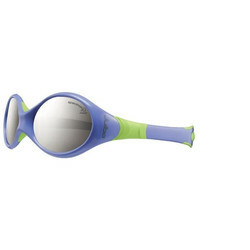 I'd purchase again from Julbo"
"I have only worn them for one weekend camping trip, but I had them on from 8am to 8pm. They are light enough that you don't feel like you are wearing anything. The photochromatic lenses range works so well that it feels like there is a constant sunlight strength all day. Very easy on the eyes. Would definitely recommend to anyone." "Excellent sunglasses. Never fog, quick adjustement to light conditions"
"These are perfect on my 4-month-old. We used to have to rig up some sort of thin cotton blanket with clothes pegs when he was in the stroller so he wouldn't be blinded by the sun. Life is easier now! We have baby banz as well but they seem uncomfortable with their hard plastic and they fall down all the time. Love these. We'll definitely be buying a bigger size next summer!" "Very happy with the Looping 1 2 and 3 I purchased. My kid actually wears them and they stay on!" "Right eye: sphere -0.75/cylinder-0.75/axis090/add+2.25 and my Left eye: sphere -.50/cylinder-1.00/axis080/add+2.25"
"So light anx stable you forget about them. With the zebra light lens you can canwear them from before sunset to after sun down"
"I'm a serious amateur triathlete and these shades are perfect. The size is just right, the field of vision is completely unobstructed, they weight almost nothing and they adjust to the amount of ambient light. I would recommend these to any athlete." "Exceptional service and advice. Much appreciated. Just bought another pair of Julbo's"
"Great ski goggle excellent service from Julbo Canada very pleased"
"they were a perfect fit"
Love both pairs of glasses. "Love both pairs of glasses. Comfortable and versatile for many sports. Thanks!" Quality product, will purchase again. "Quality product, will purchase again." "J'ai acheté ces lunettes de soleil pour ma petite fille de trois ans pour le chalet. Quand nous lui avons présenté les lunetes elle était émerveillé par les couleurs de même que ses parents. Pour ma part, je voulais qu'elle ait une protection plus qu'adéquate contre les rayons du soleil. Mon expérience personnel avec JULBO ( j'ai une paire de Julbo Trek) fait en sorte que je suis assuré de la grande qualité de ce produit pour enfant. Je les recommande pour tous les enfants." "Merci, j'adore ces lunettes. Service rapide et efficace." "AMAZING Product and very efficient purchase experience"
"Wow ces lunettes sont simplement superbes"
"nice product and good service, thanks"
"Incredible fit and optics. Look no further if you are looking for superior quality and performance." I love the Breeze sunglasses. "I love the Breeze sunglasses. Perfect fit."